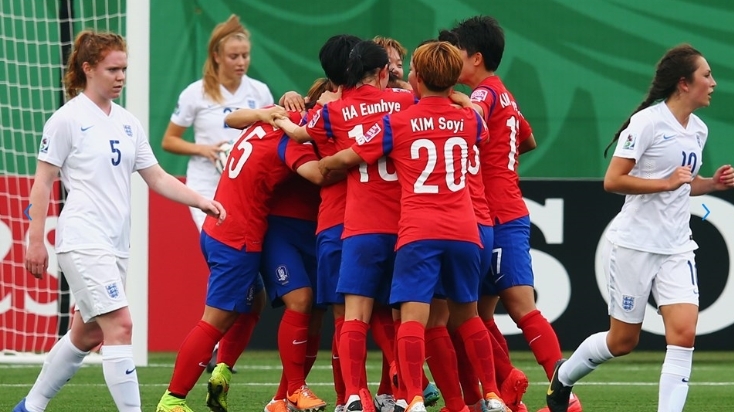 The group matches of the FIFA U-20 Women’s World Cup is finally finished and Korea Republic advanced to the quarter final by edging Mexico last night. They will face France on August 17th at 7 p.m. (local time) at Montreal Olympic Stadium. Here’s a closer look at each group matches. 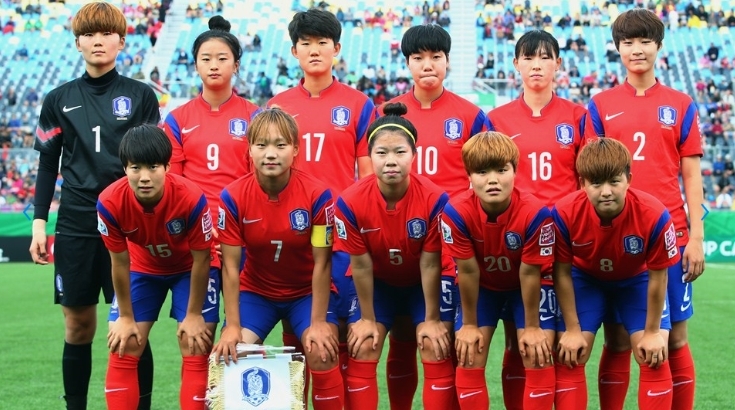 The Taegeuk ladies and the Young Lionesses had a nervy 1-1 draw in Moncton Stadium on August 6th at 5 p.m. (local time) after Martha Harris (#2) scored a 68th minute equalizer to cancel out Lee So-Dam (#8)’s first-half penalty. After showing an impetuous desire to attack, in the 15th minute the Taegeuk Ladies were rewarded for their attacking efforts when Lee So-Dam (#8) slotted home a penalty after Jang Sel-Gi (#7)’s cross from the right struck the hand of the defender, Aoife Mannion (#5). Then, England almost had an instant reply when Katie Zelem (#10) hit the crossbar. The Young Lionesses then had the last significant opportunity of the half when Nikita Parris (#7)’ cross shot was cleared by the Korean goalkeeper, Min Yu-Kyeong (#1). Then the second half began and England soon scored from an indirect free-kick delivered by Zelem in the 68th minute. Korea Republic’s keeper Min Yu-Kyeong failed to clear the ball and Harris tapped in the equalizer to cancel out Lee So-Dam’s penalty. The aim was getting the three points, but we got a draw and although I’m a little bit sad about it, at the same time I’m very happy because my players gave their best and I would like to thank them for this effort. The first game is always the toughest, but I’m happy because we tried hard. The second half was harder for us, but we are going to learn from this and prepare ourselves better for the other two games against Nigeria and Mexico. 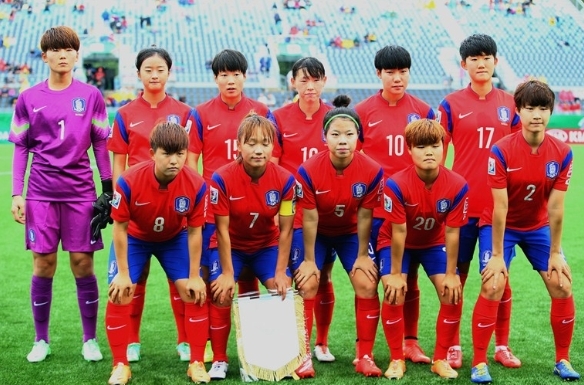 The Taegeuk Ladies faced Nigeria at Moncton 2010 Stadium on August 9th at 5 p.m. (local time) for their second group match. 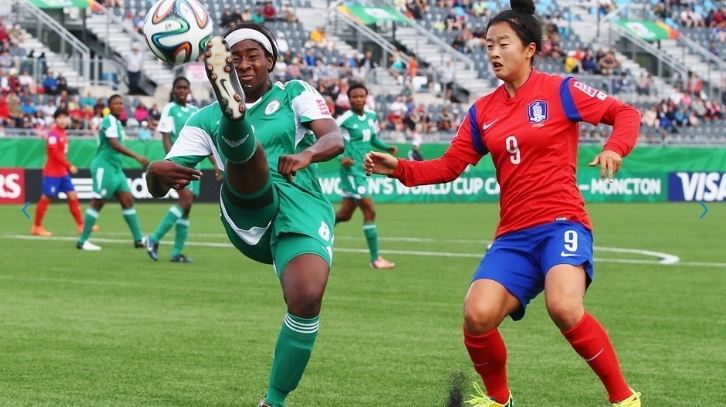 Nigeria hold off Korea Republic to go top with the final score of 2-1. Nigeria’s Courtney Dike (#8) who started her first match of the competition scored the fastest goal in the history of FIFA women’s tournaments after she latched onto the ball just outside the Korea Republic six-yard box, saw a gap and set her sights and sent a low shot inside the far post, putting her team ahead after 18 seconds of play! 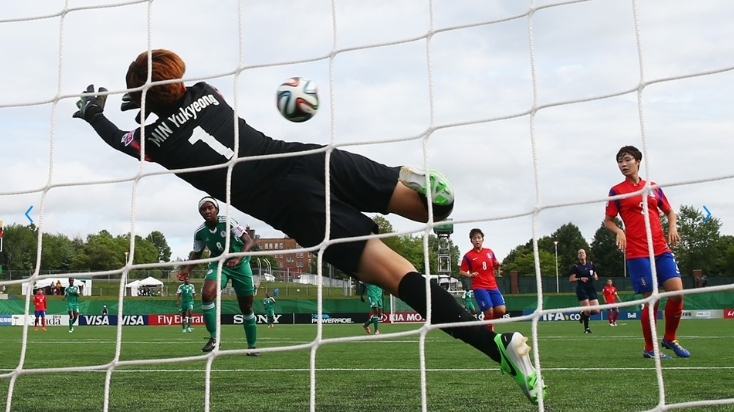 The Super Falconets continued to threaten the Taegeuk Ladies, when Osarenoma Igbinovia had a shot tipped over the bar by Min Yu-Kyeong (#1). On the other hand, Korea Republic had their first opportunity in 24th minute when Kim So-Yi’s (#20) shot went over the bar. Then, in the 36th minute when Ugo Njoku (#15)’s cross from the right wing found Chinwendu Ihezuo (#19) who fired a powerful shot past the goalkeeper, Min Yu-Kyeong (#1). The second half of the match started with the Nigerians leading 2-0 and the best chance for Korea Republic appeared in the 59th minute when Kim In-Ji (#11) shot from the left side of the penalty area which was inches wide of the near post. Then, in the 71st minute when Nigeria failed to clear their lines effectively, Kim So-Yi (#20) scored from the edge of the penalty area. However, while the Asian champions often threatened an equliser, Nigeria’s defense held on to claim the first win of the group in Moncton. Even though we lost today, I’m happy to say that my players did their best. We had talked a lot about this game against Nigeria and about how strong and fast they are, and we had a plan and I think we executed that plan. I only regret not having scored more goals. Now we’ll prepare ourselves properly for our final group game against Mexico in a few days. Korea Republic brought home a first win of the tournament over Mexico at Toronto’s National Soccer Stadium on August 13th at 8 p.m. (local time), and also advanced to the quarter-final against France. Mexico’s Fabiola Ibarra (#11) provided the game’s first effort with a long range shot that Min Yu-Kyeong (#1) did well to save. 2 Minutes from the break, when Lee Geum-Min (#10) missed an amazing opportunity when she sliced wide from eight yards after Mariel Guttierez (#5) had miss-kicked her clearance. However, Lee Geum-Min took a long ball on her chest, cushioned it on to her right foot and flicked a first time, outside of the foot shot high beyond Mexico’s goalkeeper, Cecelia Santiago (#1). Even though, Mexico pushed hard for an equalizer, the Taegeuk Ladies were rewarded a penalty when Clarissa Robles (#2) was penalized for a foul on Lee Geum-Min with 25 minutes remaining before the final whistle sounds. Cecelia Santiago guessed right on Lee So-Dam (#8)’s spot kick, the set piece specialist’s strike was hard and accurate enough and fired low in the corner to leave Santiago with no chance. Then, in the 74th minute when Tanya Samarzich (#7) shot on goal when Lee Sodam poorly touched on the edge of her box. Although this goal was marked to be the most impressive strike of the match day, it was not enough to prevent Mexico’s early exit from the competition in the end. In the 82nd minute, Mexico concede a free kick following a challenge from Park Ye-Eun (#15) who was yellow carded and she will be missing the next match against Les Bleuettes. This was the most important game for us and I’m happy to see how my players managed to play despite the pressure. Although we came away with a loss and a draw from our first two games, I was actually happy with overall play. Tonight, we got the performance and the result; we couldn’t be happier. Now I’m looking forward to our quarter-final and I hope we will get better. We have already reached our main goal, to qualify for the second round, but it doesn’t mean that we have to stop here. ↑ Team Korea posing for a picture after their victory against Mexcio!